John Hammond Still Looms Over Jurassic World in New ‘Fallen Kingdom’ Featurette! According to the online viral campaign for Masrani Global that accompanied Jurassic World’s release in 2015, John Parker Hammond passed away shortly after the events seen in The Lost World: Jurassic Park in 1997. Despite that, the legend of the entrepreneur is still alive and well more than twenty years later. In a new featurette for next month’s ‘Jurassic World: Fallen Kingdom’, we see Claire Dearing in Benjamin Lockwood’s manor standing in front of a large portrait of none other than John Parker Hammond, who’s bears a striking resemblance to when we last saw him in The Lost World – though perhaps a little healthier. While little else can be gleaned from this appearance, it’s clear that Lockwood’s relationship with Hammond, and it’s deterioration before the events of Jurassic Park, will be an interesting look back into the mythos of the franchise. Accompanying this featurette comes the Production Information for the movie which is now available to view online and you can find embedded below! While this may not offer any groundbreaking spoilers from the plot of the movie, it does give us a chance to get to know the characters before their debut as well as setting the stage for what we will see next month. Take a look below! The document also dives into detail about the talent behind the camera including a short piece detailing director J.A. Bayona joining Team Jurassic. Are you excited to discover more about the legacy of John Hammond and Jurassic Park’s dark origins? Sound off below! New Jurassic World Fashion Collection Allows You To Wear Jurassic With Pride! If you’re looking to wear something a little bit more fashionable than your average Classic Jurassic t-shirt, then Torrid’s new Jurassic World Collection may be right up your alley! Released today, this mix of dresses, midi skirts, sports bras and more, allows you to show off your appreciation and love for Jurassic World in a fashionable, yet more subtle way. With sizes ranging from 10 to 30 (US) this collection is available exclusively on Torrid.com, with some selected items making their way into 350 Torrid stores nationwide. While the fan favourite Classic Jurassic t-shirt does make an appearance, one item of clothing does pay homage to the Jurassic Park: Institute, a long retired official website featuring a database of dinosaur facts and guides. Be sure to check out the exclusive Torrid fashion collection now, and let us know what you favourite piece of Jurassic Park/Jurassic World clothing is! Also, if you don’t own a Classic Jurassic t-shirt, can you really call yourself a fan? Jurassic World: Fallen Kingdom Premieres in Madrid, Spain and The First Reactions Are In! The World Premiere for Jurassic World: Fallen Kingdom took place today in Madrid, Spain. While celebrities and guests had to dodge rain and even hail during the red carpet, the day capped with the first official showing of the 5th installement of the Jurassic Park film franchise and it recieved a 10 minute standing ovation. Early buzz and reactions from people who attended the premiere appear to be mostly positive. A lot of the praise seems to be in regard to the job director J.A. Bayona did on the film. Check out some of the initial reactions on Twitter from the Spanish auidence. Rough translations of the tweets into English are below. English translation: # JurassicWorld2 is the continuation that the saga deserves. It is not only interesting as it arises, but what is to come is going to be BRUTAL. @FilmBayona, you don’t disappoint. Vale, vista Jurassic World: El reino caído. English translation: OK, saw Jurassic World: Fallen kingdom. AWESOME. Very different from the first, an incredible film, the music has left me blown away. Very, very, but that very recommended. I watched the whole movie with my eyes wide open. Go see it for real. The #FallenKingdom es el peliculón de 2018. Vais a flipar y os vais a cargar! Enhorabuena @FilmBayona! English translation: The #FallenKingdom is the movie of 2018. You will flip and you will load! Congratulations @FilmBayona! While the far majority of the initial reactions were positive, not everyone was in love with the latest installment. #JurassicWorld2 cumple como blockbuster pero me decepciona como película de Bayona. Es un encargo muy bien resuelto, pero ofrece pocas sorpresas. Es la primera película de Jota que no me emociona. Plantea varios debates morales/sociales muy interesantes. Vista #JurassicWorld2 he de decir que algunas escenas me han sorprendido y resultado magníficas, pero algunas decisiones de guión como cierto momento relacionado con la pequeña… me han parecido bastante chapuceras. English translation: Saw # JurassicWorld2 I have to say that some scenes have surprised me and turned out great, but some script decisions as a certain moment related to the little one … have seemed pretty sloppy. Jurassic World: Fallen Kingdom opens on June 6th in the UK and June 22nd domestically. Over the next couple of weeks we will start to see reviews from film critics pour in, so stay tuned for our coverage on that! What are your thoughts about the first reactions of Jurassic World: Fallen Kingdom from the World Premiere in Spain? Let us know your thoughts in the comments below and on our forums. The website CollegeHumor has released a new comedy sketch featuring Chris Pratt and Bryce Dallas Howard as their Jurassic World characters Owen Grady and Claire Dearing. In the sketch, Owen and Claire are at an airport trying to pass Blue the Velociraptor off as a service animal. What are your thoughts on this comedy sketch? Let us know your thoughts in the comments below and on our forums. 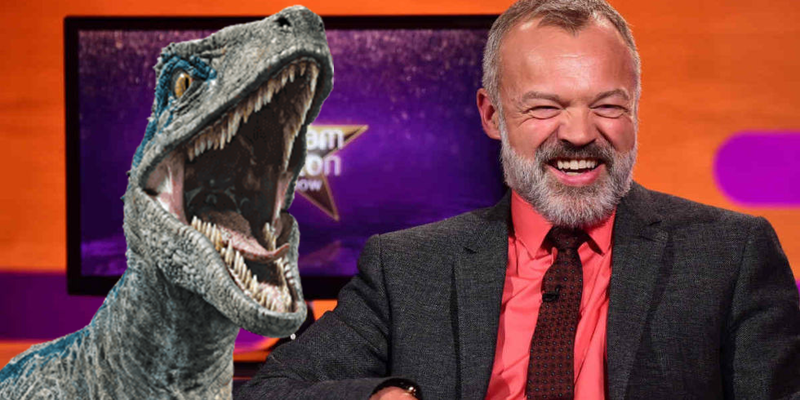 The Graham Norton Show to Host Jurassic World Special! In the first of what is sure to be many talk show appearances, Graham Norton will host Chris Pratt, Bryce Dallas Howard and Ian Malcolm himself, Jeff Goldblum on his famed sofa in a Jurassic World: Fallen Kingdom special this May. It’s common for guests of the show to bring new footage with them, so keep your eyes peeled for an exclusive look from the upcoming film! Also, did you catch the latest TV spot with a new look at the Stygimoloch? Check it out below! The Graham Norton show airs on Friday 24th May. Will you be watching?